4squick v0.96 Beta available at Ovi Store. FourSquare users, 4Squick has been updated to 0.96 and it’s available at Ovi Store. The MeeGo-Harmattan version will appear in a few days. This is one of a growing number of classy looking MeeGo-Harmattan/Belle styled apps. It’s a breath of fresh air for Symbian. I can’t wait to play with official Belle devices :D.
First Store release of 4squick! This version is still free. It will expire when we release a new update. Later on we’re going to release a paid version. When that happens, a free version will probably continue to live with some features removed. We’ll give users more insight when we know exactly what’s going to happen. If you have used 4squick earlier, you need to uninstall old version before the new Store version can be installed. In some cases you’ll see two apps: “4squick” and “4squick installer”. Uninstall both. 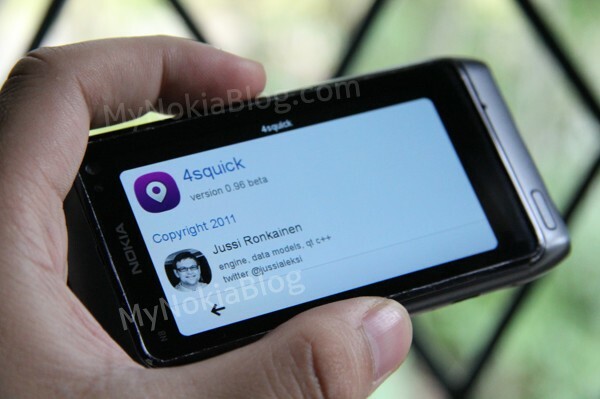 After you have uninstalled previous versions, just click the link below or head to Nokia Ovi Store and search for 4squick! If you still cannot install, do the following Voodoo Magic (sounds strange but it does work for some reason unknown to man): Install v0.95, leave it, install v0.96 from Store, wait for installation to fail, uninstall v0.95, click Smart Installer icon from Application grid to install v0.96. Thanks @bhavanishankar for the tip! « Nokia 603 – Symbian Belle with ‘Keypad’? – E6 successor, T9 keypad or just touch? – on par with 700?